Harris comes in THIRD in her home state less than a year out from the 2020 Democratic Presidential primary? Former Vice President Joe Biden is the leader of the pack with 26 percent of California Democrats and voters leaning Democratic, according to a Quinnipiac University Poll released today. U.S. Sen. Bernie Sanders of Vermont takes 18 percent of Democrats and Democratic leaners, with 17 percent for native daughter, U.S. Sen. Kamala Harris. U.S. Sen. Elizabeth Warren of Massachusetts and South Bend Mayor Pete Buttigieg have 7 percent each, with no other Democratic contender topping 4 percent, the independent Quinnipiac (KWIN-uh-pe-ack) University Poll finds. 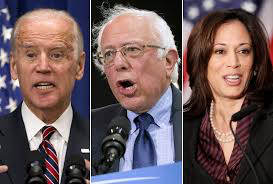 35 percent say Biden has the best chance of defeating President Donald Trump in 2020, with 17 percent for Sanders and 9 percent for Harris. Being a great leader is more important in a presidential candidate than having great policy ideas, all voters say 50 – 39 percent. Democrats and Democratic leaners agree 52 – 38 percent. The issue of Biden touching women is not serious, 66 percent of all California voters say, including 67 percent of women and 71 percent of Democrats. Among all voters, 27 percent, including 26 percent of women, 37 percent of Republicans and 24 percent of Democrats, say this is a serious issue. I’m gonna repeat something this dig has been saying here and on social media’s twitter…. Joe Biden IS the front runner for the nomination…. It is his to lose…. Joe Biden would BEAT Donald Trump for the Presidency…. The election in a year and half away….